Set in Edinburgh’s historic city centre, our modern holiday apartments provide the comfort, space & privacy of your own home in convenient locations throughout primarily in Edinburgh’s sought after Royal Mile. With restaurants, bars, shops & the main tourist sites on your door-step, Burnet’s Apartments present themselves as the ideal base from which to explore Edinburgh. Just a short walk from the apartments will bring you to the Royal Mile with Edinburgh Castle, Hollywood Palace, Princes Street & Waverley Train Station within easy walking distance. Fully equipped with all that you need for a comfortable stay, and complemented by the freedom to come and go as you please, our self-catering apartments aim to provide a home-away-from-home for your stay in Edinburgh. Our apartments are available to book for short holiday breaks 2 nights or more. 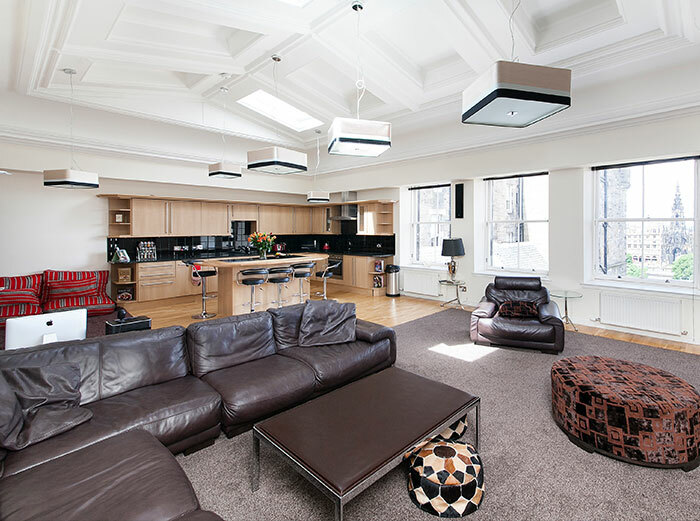 Burnet’s Apartments provide an excellent choice of accommodation in Edinburgh with offers suitable for guests whether seeking accommodation for leisure, business or for relocation. Set in Edinburgh’s historic city centre, our modern holiday apartments provide the comfort, space & privacy of your own home in convenient locations throughout primarily in Edinburgh’s sought after Royal Mile. With restaurants, bars, shops & the main tourist sites on your door-step, Burnets Apartments present themselves as the ideal base from which to explore Edinburgh. Just a short walk from the apartments will bring you to the Royal Mile with Edinburgh Castle, Hollywood Palace, Princes Street & Waverley Train Station within easy walking distance. Fully equipped with all that you need for a comfortable stay, and complemented by the freedom to come and go as you please, our self-catering apartments aim to provide a home-away-from-home for your stay in Edinburgh. Our apartments are available to book for short holiday breaks 2 nights or more. Burnets Apartments provide an excellent choice of accommodation in Edinburgh with offers suitable for guests whether seeking accommodation for leisure, business or for relocation. One of the world’s most popular visitor destinations. Today, the Royal Mile is an eclectic mix of tourist shops and eateries as well as pubs and historical attractions. It also serves as the heart of Scotland’s legal system, being the home of both the High Court of Justiciary and the Court of Session. Edinburgh was recently voted as the most desirable places to stay in the UK and it is one of the world’s most popular visitor destinations. Burnets Apartments have a number of holiday apartments located in and around The Royal Mile, from 2 bedroom vacation rentals such as The St. Giles Apartment & Burnets Apartment to 3 bedroom luxury at Royal Mile Mansions. Additional Apartments on the Royal Mile also include Parliament One & Two on Parliament Square Parliament Square, named after the old Parliament House which housed both the law courts and the old Parliament of Scotland between the 1630s and 1707. Set in Edinburgh’s historic city centre, our modern holiday apartments provide the comfort, space & privacy of your own home in convenient locations throughout Edinburgh’s sought after Royal Mile.